I’ll do a series of more detailed posts after I come back, but here is a brief synopsis. The mBed ingests the GPS data, range finder and compass data and works out where it’s currently pointing and the delta to where it needs to point to reach the next waypoint. The delta is fed in to a PID control algorithm that controls the steering servo. Currently the speed controller is a static speed (slow) but as I get more confidence in the testing, it will be proportional to the distance from the next waypoint (i.e. faster, then slowing as you near the turn point.) The range finder is processed and inserts an offset in to the PID control input if it detects an obstacle, to try and steer round it. 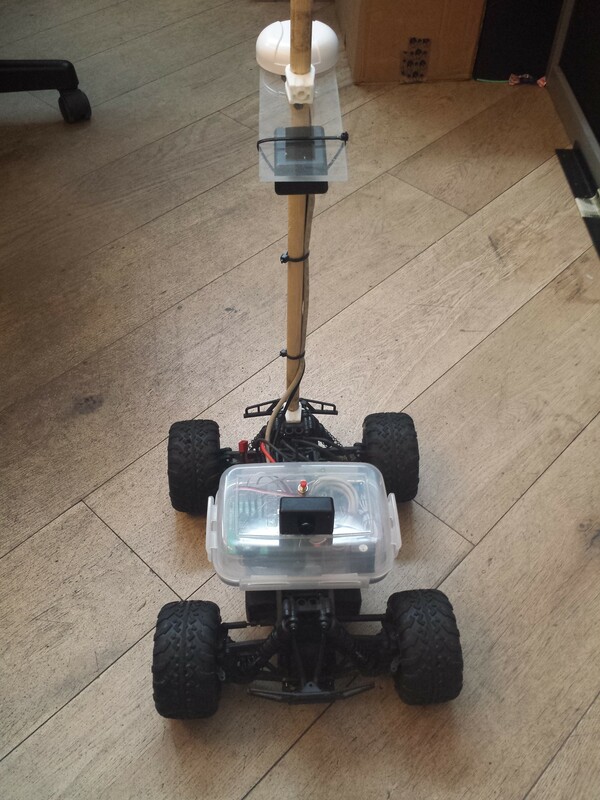 This entry was posted in SparkFun AVC and tagged Autonomous Vehicle, AVC, GPS, IMU, Magnetometer, mBed, Sonar, SparkFun on May 29, 2013 by mostlyrobots2012.